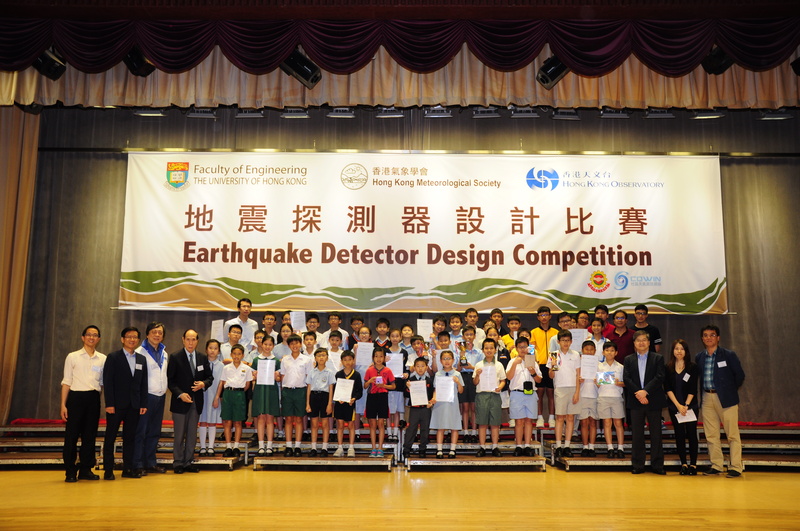 Participants of the "Earthquake Detector Design Competition" all gathered at the Project Exhibition, Judging and Award Presentation Ceremony held on May 6, 2017 (Saturday) at the Grand Hall of TsimShaTsui Kai Fong Welfare Association. 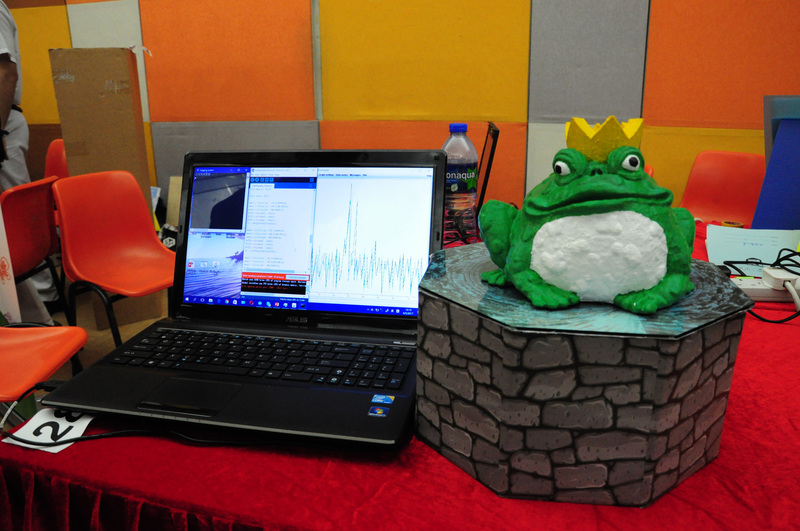 The competition was jointly organized by the Faculty of Engineering of HKU, the Hong Kong Observatory (HKO) and the Hong Kong Meteorological Society (HKMetSoc). The event is a major episode of the "Earthquake in Hong Kong?" project funded by the HKU Knowledge Exchange Fund. The project is led by Professor Francis C.M. Lau from the Department of Computer Science, with Dr. Beta C.L. Yip and Dr. Ivy K.Y. Wong as core members. 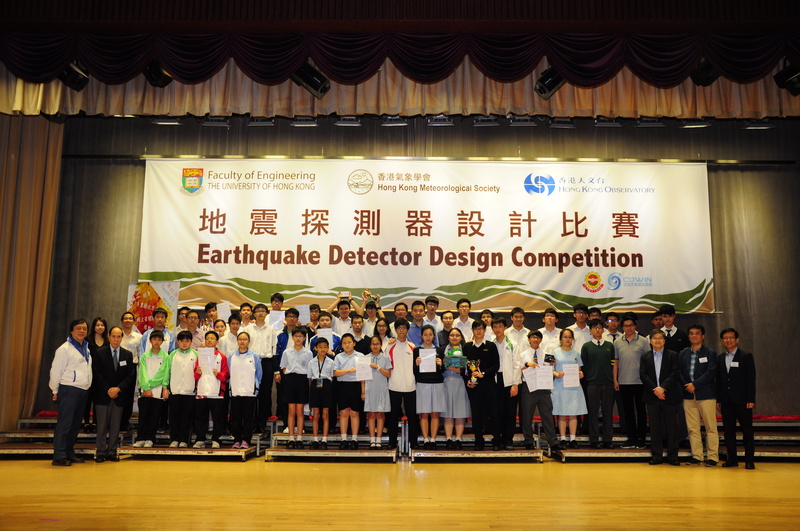 46 teams of students from primary, secondary and international schools in Hong Kong showcased their own designs of earthquake detectors at the exhibition to compete for a number of awards. Participants gather and share their ideas, demonstrate their work, and exchange their knowledge with each others. Earthquake detectors handmade from simple materials like straw, plastic, wood, paper boxes, buzzer, or beans, to more sophisticated components like motion sensors, accelerometer, credit-card sized computers, and technologies like 3D printing and laser cutting were used in the design. Dr. Beta C.L. 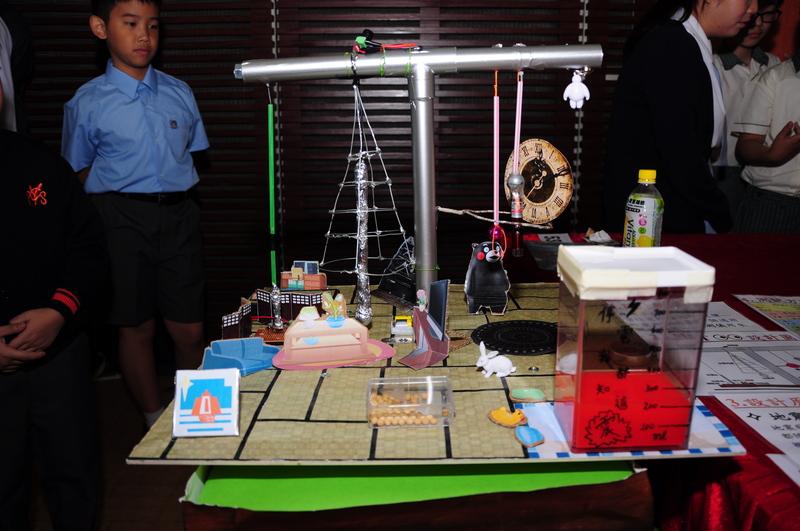 Yip, a judge of the junior school category, was impressed that participants have designed and implemented a great variety of methods for earthquake detection, and that students at different levels can program computers for their designs. Professor Francis C. M. Lau, the Principal Investigator of the project, is very much impressed by the creativity of the students shown in the competition. Click here for the list of winners and photos at the ceremony. For more information, please visit the Facebook page of the competition and read the press release by HKU.